2. This photo shows the fuselage halves of the new Sanger Engineering 1:72 Mi-26 'Halo'. The fuselage is about 46cm (18") long, and about 9cm (3.5") across at its widest. 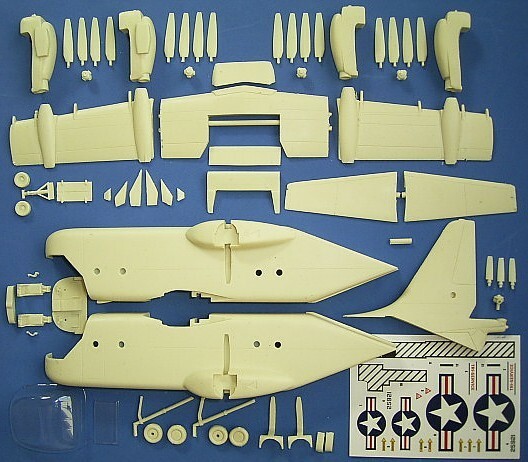 There is also a bag of white metal parts, a vac-form canopy, and basic decals. 3. A new name to HKN, Llama Models, are proposing a 1:72 resin S-72 convertiplane. 4. A test shot of the additional sprue in the new Revell AH-64D Longbow has been posted at the DPMV (Deutscher Plastik-Modellbau-Verband). Other information published there suggests to us that the assertion (in various magazines) that this will be a re-box of the Hasegawa kit is not true. We will see in December. The release date of the 1:72 EC145 now seems to have been moved back until January 2005. 5. Italeri are planning to (re)issue their OH-6A Cayuse (as #1028), and HH-53C Super Jolly (as #1035), probably in time for Christmas. It seems likely that they will include new decal options. 6. The second resin detail set from Heliborne is now ready. This is a cockpit interior set, #72003, for the Mi-8MT / Mi-17 kit #7253 from Zvezda. As before, pictorial instructions with detailed assembly and painting information in English are included. Examined with an eyeglass, some resin sets can look rather rough; but if you magnify these Heliborne parts, you just see even more detail and an almost incredible level of fine craftsmanship. Puma - general detail set (resin, etched brass & white metal) with instrument panels, cabin doors, steps, wipers, etc. Whirlwind - fuselage halves & cabin door with extra windows to make the Royal Flight HCC.8 plus Danish and Japanese (among others) Whirlwinds & H-19s. UH-1D - detail set for the German Army/Luftwaffe including flotation gear, internal winch, bubble windows, new doors aerials, bladder fuel tank, and the new-style rotor blades which only the Germans seem to use. Some of these components are also available separately. Alouette III - etched brass skis and external baskets (with plastic mesh). Also in preparation by a third party is a new Whirlwind Series 3 turbine nose, which should be more accurate than the Airwaves one and with more detail (a hollow nose cap, for example, with an engine intake visible from underneath etc.). It is not known when this will be available, but it will be distributed through the same outlets as Whirlybird products - Linden Hill and Heritage Aviation. 8. Zotz / Albatros have now released their 'Latinoamericanos' Hinds decal sheets in 1:35, 1:48, and 1:72 scales (35006, 48013 & 72013). 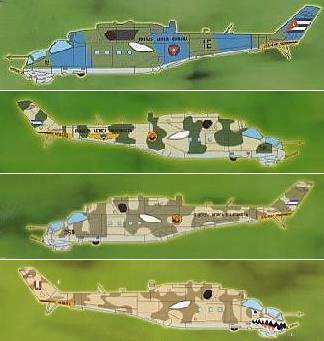 These all have decals for four Hinds; Nicaragua AF, Fuerza Aerea Sandinista, Cuba, and Peru (with shark mouth). Note that these sheets are designed to be used in conjunction with the Linden Hill Mi-24 stencil data sheets. 9. Aerocalcas Argentina have released a number of new decal sheets since we last gave them a mention here. The following is a complete listing of their sheets that include helicopters, all are for the Argentine armed forces, and most of them are illustrated at Aerocalcas and also at Flightdecs. Thanks to Roger Evans (Whirlybird), Joe Maxwell (Max Decals), Harold Stockton, and Yevgeny Borissov (Heliborne).